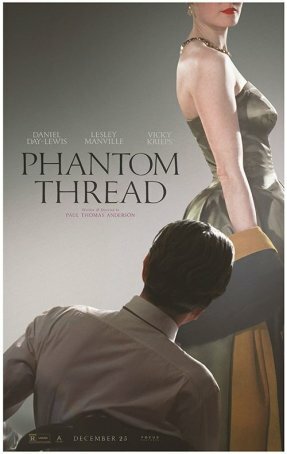 Phantom Thread, Paul Thomas Anderson’s follow-up to 2014’s Inherent Vice, feels a little like a mash-up of Bergman and Hitchcock without the verve of the latter and the subtleties of the former. What begins as a stately costume drama set in the world of ‘50s London couture turns into a twisted psychosexual story of jealousy, power, and co-dependency. Unfortunately, to get to the psychologically complex parts of Phantom Thread, it’s necessary to wade through nearly an hour of background and character development that seems more like Masterpiece Theater than Mystery! For Daniel Day-Lewis’ final acting job, he gives it his all, playing fashion designed Reynolds Woodcock as a tightly-wound ball of impulses, quirks, and foibles. An impatient perfectionist, Reynolds is prone to angry outbursts, lives an ordered life, and dislikes surprises. He can be passionate but is more often cold and condescending. He lives with his sister and partner, Cyril (Lesley Manville), who protects him from distractions, cleans up his messes, and provides a buffer between him and anything or anyone who threatens to puncture the bubble in which he works and creates. Day-Lewis brings Reynolds to life with every shade of gray imaginable – in one scene we sympathize with him then, moments later, we despise him. Into his life comes Alma (Vicky Krieps), a waitress who catches his eye one day when he’s out having breakfast. They banter, he invites her to dinner, and soon she has moved into his house and is functioning as muse, model, and lover. Their relationship slowly deteriorates as Alma becomes more aware of Reynolds’ “fussiness” and is unable to chip away at the bond between him and Cyril. But Alma isn’t like the many other women Reynolds has bedded and turned away. She’s made of sterner stuff and, after the failure of a romantic attempt to move their relationship forward, she tries something bold that reveals darker aspects of both their personalities. The second half of Phantom Threads is fascinating and riveting as Anderson peels back the oh-so-proper veneer of Reynolds and Alma’s relationship. This is as warped a love story as one is likely to find and it leaves the viewer questioning what these two feel for one another. There’s nothing simple in how they interact and Cyril is never too far away to stir the pot. Often, Alma’s greatest struggle in attracting Reynolds’ attention is eroding his sister’s influence. This becomes a long-term battle that at times seems unwinnable. Anderson, as is his wont, allows the movie to flow at its own pace. He won’t be hurried and, as a result, watching Phantom Thread requires a degree of patience. I’m not knowledgeable about fashion in general and ‘50s fashion in particular but I was fascinated by all the little details Anderson reveals during the course of the film, such as how small tokens and trinkets can be sewn into seams without anyone knowing about them. Verisimilitude is a hallmark of Anderson films and it’s as evident here as it was in the vastly different Boogie Nights and Inherent Vice, both of which effectively captured the time and place in which they occurred. Phantom Thread is an art-house film for those who love acting showcases featuring minimal storylines that focus more on character interaction than narrative thrust. It starts slowly but eventually develops into something that is in equal parts fascinating and disturbing, and leaves an impression that doesn’t evaporate once the end credits have rolled.